30 of the 40 largest banks grew marketing spend in 2017, with 17 reporting double-digit growth. As in past years, banks with national credit card franchises lead all others, in both absolute terms and in their marketing intensity (marketing spend relative to revenues). In 2017, spending among these card leaders declined, as focus shifted from acquisition to portfolio marketing. Two banks notable for substantial 2017 marketing increases are Goldman Sachs Bank focused on promotion of its online lending platform, Marcus by Goldman Sachs, and U.S. Bank capitalizing on brand-building around the Super Bowl, held last week at the Minneapolis stadium bearing the bank’s name. EMI annual analysis of Federal Financial Institutions Examinations Council (FFIEC) call report data for 40 leading U.S. banks distills both absolute spending and marketing intensity ratios, as measured by spend percentage of net revenues (net interest income plus noninterest income). Results are reported below. 19 banks/bank charters had advertising and marketing budgets of more than $100 million. 5 had billion-dollar-plus budgets (JPMorgan Chase, American Express, Capital One, Citigroup and Bank of America). U.S. Bank: +$107 million, with a focus on growing national profile behind the increased marketing spend, including heavy branding around the Super Bowl, which was held last Sunday at the U.S. Bank Stadium in Minneapolis. Goldman Sachs Bank: +$80 million, driven by an advertising campaign to promote Marcus by Goldman Sachs, its online personal lending platform. First Republic was also notable for its 46% increase–a strategy that seems to have paid off with 18%+ revenue growth reported by the San Francisco-based bank in 2017. Other banks boosted marketing spend to support new campaigns in 2017. BB&T (+10% to $89 million) introduced a new brand campaign and tagline (“All we see is you”) in September 2017. SunTrust (+38% to $220 million) rolled out its ‘Confidence Starts Here’ ad campaign in March 2017, building on its onUp movement focused on building financial well-being. Capital One: decline of $139 million, with a strong drop in spending in its card unit partially offset by a $23 million rise in its retail banking unit. American Express: down $111 million, although this follows a ramp up of marketing and promotion spending in recent years. American Express is also increasing its focus on targeting existing clients, which typically involves lower marketing spend. Even though 30 banks increased their marketing budgets in 2017, only 14 increased their bank marketing ratios, meaning that growth in marketing spend did not match the rise in net revenues. Banks with the strongest growth in their marketing ratios were Goldman Sachs Bank (+183 basis points), SunTrust (+61 bps) and U.S. Bank (+44 bps). Most retail banks have marketing ratios of 1-3%. Those with the highest marketing ratios include Santander Bank (4.1%, due to continued growth in the bank’s U.S. marketing budgets in recent years) and BMO Harris (3.4%, following a 17% rise in marketing spend in 2017). 4 banks have marketing ratios of less than 1%. Most notable in this category is Wells Fargo, which has traditionally–and infamously–focused on sales and required much lower advertising budgets than its peers. Wells Fargo did launch a new integrated marketing campaign in April 2017, which it reported was focused on “rebuilding trust.” This contributed to a 4% rise in its advertising and marketing budget in 2017, but its spend levels remain well below comparably-sized banks. We expect that banks will maintain or even increase their marketing budgets in 2018 to build brand awareness and affinity, as well as to promote new products and services–in particular those focused on digital transformation. However, many banks remain focused on improving efficiency ratios, and marketing budgets are often on the firing line when banks look cut costs. However these cuts–when executed without a careful strategy for maximize marketing ROI–often sacrifice market share gain and longer-term growth. According to EMI Strategic Marketing’s analysis of data from the Federal Financial Institutions Examination Council (FFIEC), U.S. banks spent $17.1 billion on advertising and marketing in 2016. This expenditure represented 2.4% of bank revenues. Five banks (JPMorgan Chase, American Express, Citigroup, Capital One and Bank of America) each spent more than $1 billion, and together accounted for more than half of the industry’s total expenditure. 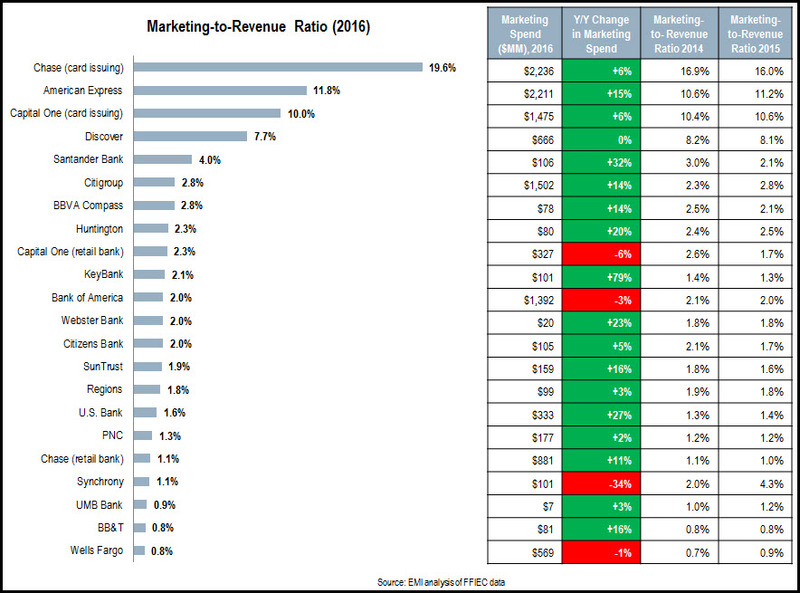 The following chart looks at 2016 marketing-to-revenue ratios for 20 leading U.S. banks (note that for JPMorgan Chase and Capital One, marketing spend data is provided for both their retail bank charters and card-issuing units). Most banks grew their marketing spending in 2016, as they looked to drive revenue growth in an improving economy. 10 banks reported double-digit percentage rises in their advertising and marketing budgets. In some cases (e.g., KeyBank and Huntington), the strong increases were in part the result of significant bank acquisitions. 13 banks grew their marketing-to-revenue ratios in 2016. 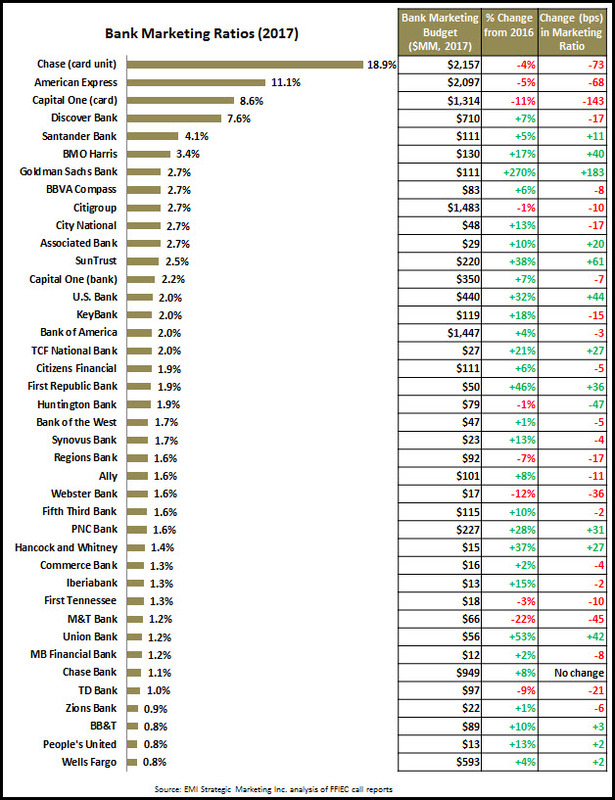 Half of the banks in the chart (mostly branch-based banks) have marketing-to-revenue ratios of between 1.5% and 3%. Several banks have been ramping up their marketing spend in recent years. Between 2014 and 2016, Santander Bank’s spend nearly doubled between 2014 and 2016, and its 2016 marketing-to-revenue ratio of 4.0% was the highest among branch-based banks. At the other end of the scale, both Wells Fargo and BB&T have ratios consistently below 1%. Credit card-focused banks/bank charters have the highest marketing-to-revenue ratios. Chase Bank USA (JPMorgan Chase’s card-issuing bank) had a ratio of almost 20% in 2016. The sharp rise in the ratio from 2014 and 2015 was due to both a 6% rise in advertising and marketing spend (to support the launches of Freedom Unlimited and Sapphire Reserve), as well as a sharp decline in noninterest income. American Express increased in its advertising and marketing spend by 15% in 2016, and its ratio rose to nearly 12%. As banks look to scale back their branch networks both to save costs and adapt to changing bank channel usage (in particular for everyday banking transactions), they are also cognizant of the potential loss of the branch’s role as a branding beacon in local markets. Therefore, it’s likely that a portion of the cost savings from branch network reductions will be diverted to advertising and marketing budgets. As a result, we may expect banks’ marketing-to-revenue ratios to gradually increase in the coming years. A study of the financial reports for 13 leading U.S. financial institutions reveals that 10 of these FIs reported y/y decreases in their advertising/marketing spending in the first quarter of 2013, with 7 of these banks reporting double-digit percentage decreases. Much of this is driven by bank-wide cost-cutting initiatives, with marketing typically one of the expense line items that is most susceptible to cuts. However, it is important not to take one quarter’s worth of data as a trend. This is particularly true for bank marketing spending, which fell significantly following the financial crisis in 2008, but recovered somewhat from 2010. A recent EMI blog showed that 7 of 11 leading U.S. banks increased their marketing spend between 2007 and 2012. For example, PNC reported a strong decline in marketing spending between 1Q12 and 1Q13, but this followed a very strong rise in spending from 2007 to 2012. Another way to study bank marketing spend is to look at marketing spend intensity, which we define as marketing spend as a percentage of revenues. Current (Discover and American Express) and former (Capital One) credit card monolines. In particular, Discover and American Express have limited banking operations, so remain quite dependent on their credit card business, which tends to have higher marketing spending than other financial services. In addition, Discover and American Express lack branch networks, so they need to have higher levels of advertising spend to maintain strong brand awareness. National banks (Citibank, Chase, and Bank of America), which typically devote 2-3% of revenues on marketing. These banks tend to have higher advertising to support their brands nationwide. In addition, these banks have large credit card operations. An exception is Wells Fargo, which spends only 0.5% of revenues on marketing. Wells Fargo has a national branch presence, but has a limited credit card business (unlike the other banks, it only markets credit cards to existing bank customers). Regional banks, who spend 1-2% of revenues on marketing. Finally, it is difficult to prove a correlation between marketing spending and bank growth, as many factors influence customer acquisition and revenue growth. It is worth noting that banks continue to struggle to generaterevenue growth (7% of the 13 banks reported revenue declines between 1Q12 and 1Q13). However, the three banks with the highest marketing intensity (Discover, American Express and Capital One) were among the 6 banks that did generate y/y revenue growth.